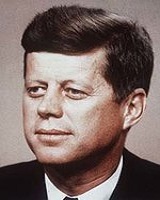 John F Kennedy 29 May 1917 22 November 1963 American Joseph P. Kennedy, Sr. Rose Kennedy Author, Politician, Screenwriter, Military Officer The 35th U.S. president, negotiated the Nuclear Test-Ban Treaty and initiated the Alliance for Progress and his own assassination. He was also an active advocate of civil rights in America. A list of popular Hindi John F Kennedy quotes are given below.